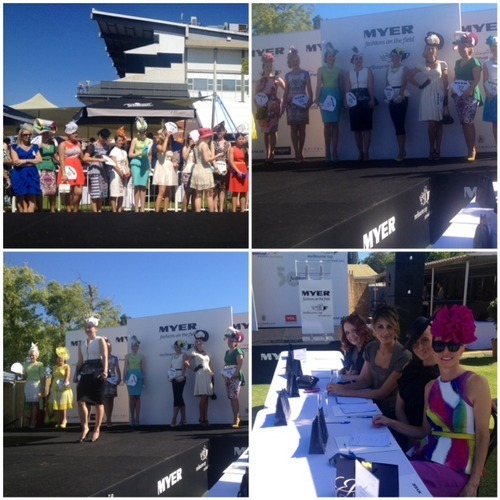 Myer Fashions On the Field, heralds the opening of the Spring Racing Carnival at Ascot. The sun shone, the bubbles flowed and oo-la-la the ladies stepped out in style. It’s a fabulous opportunity to dress in an elegant, ladylike manner. I wore an AndAndrea Carnivale of Colour!! WOW ladies! Gal pals, Ros (L) and Liana (R) came into Myer during the week, for a fun styling session. 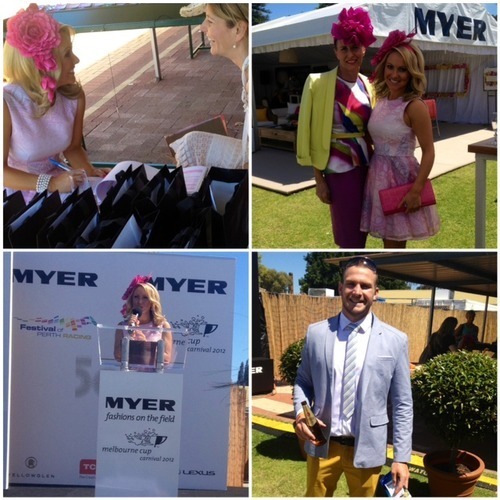 They had been invited to Ascot, as Myer VIP’s and both were keen to wear colour. I was thrilled to see the end result above. Ros wore Karen Millen florals and Liana chose Alexander McQueen. I’m wearing a Yeojin Bae tunic, with a Bardot peplum, over the top. Shoes by Siren, Miss Shop belt, fascinator by Gregory Ladner. All items are available at Myer now!! Love attention to detail. Matching Karen Millen clutches and pink lace gloves. 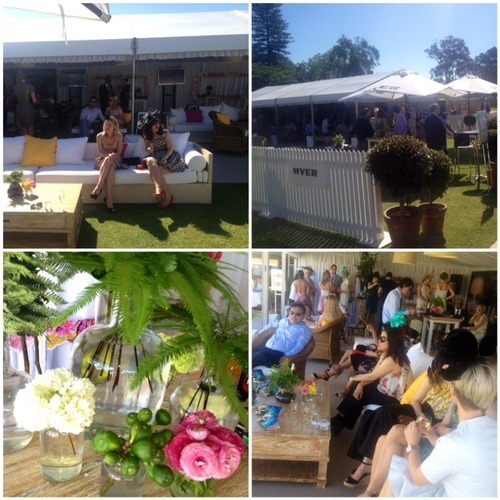 The light and airy, Myer marquee had a “Hamptons Meets Spring” feel. Guests lounged on white washed, jumbo couches. Colourful cushions, topiary trees, market umbrellas, jars of flowers and coffee tables, all helped capture a very relaxed, classy feel. 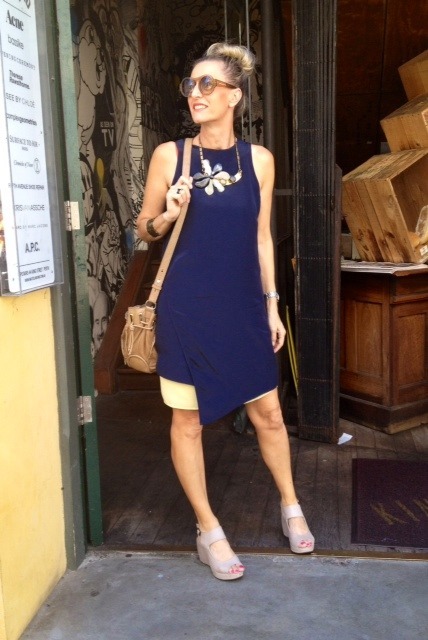 Gorgeous MC, Angela Tsun above, came into Myer for an AndAndrea styling session. She looked divine in her Nicola Finetti pink dress and Gregory Ladner headpiece. Her partner Patrick Dellit above, stood out in colour. His Politix jacket, Arthur Galan shirt and tie and USA yellow chinos looked schmick! 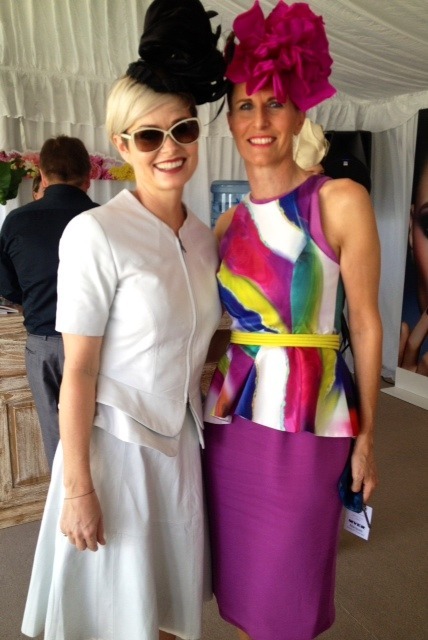 Top (L) Milliner, Reny Kestel wore classic Costarella suiting and Stylist Teagan Sewell wore an Ellery peplum. Both girlies wore stunning Reny Kestel headpieces. Top (R) Myer sweethearts, Lauren and Agata wore pretty NF florals. The girls worked tirelessly all day ensuring the guests were well looked after. Bottom (L) Snapped! Milliners Elecia Anders from Two Crowns and Emma Reynolds from Headonism, always create unique, standout headpieces. 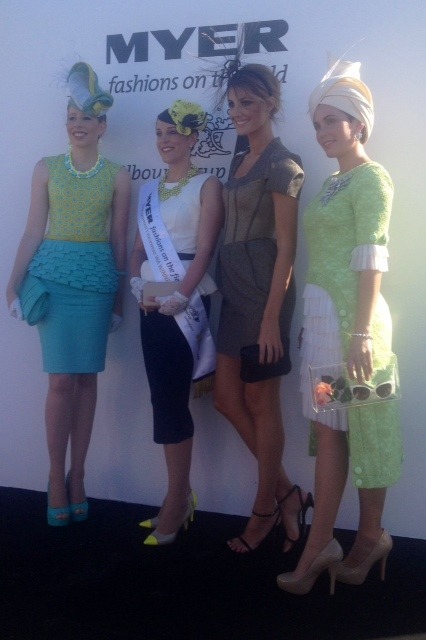 Elecia (Bottom R) who won Fashions On The Field last year, wore an elegant, champagne, peplum suit by Breathless. 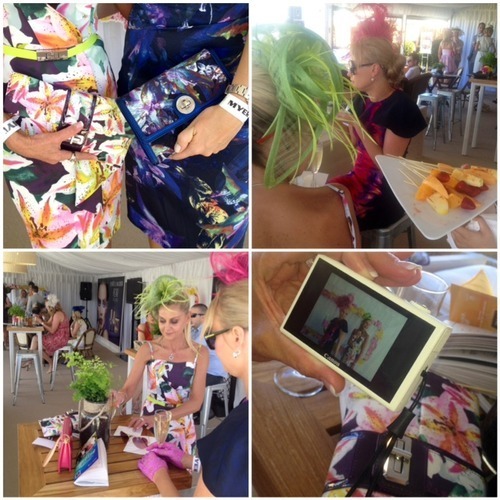 Former Miss Universe Australia, Laura Dundovic above, wowed us all in her Costarella creation and Richard Nylon fascinator. Aurelio Costarella looked impeccable in a tone on tone, nougat ensemble. 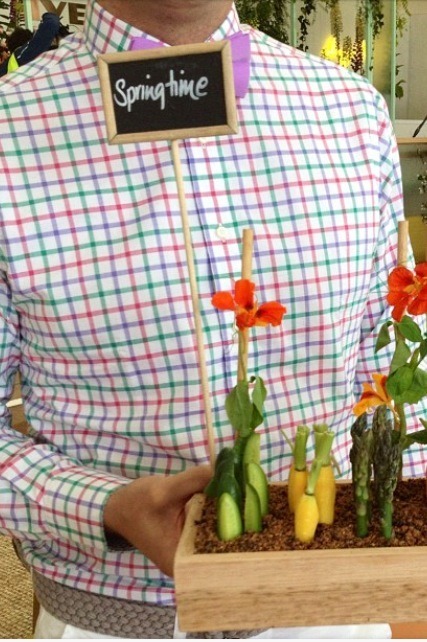 His suit is by Martin Margiela, AG shirt and Dries Van Noten tie. Paul Smith shoes, added the WOW factor. Just had to ‘feel’ the baby soft, Morrison leather suiting worn by designer, Kylie Radford, above. Right on trend with a double peplum. Her velvet headpiece was also made in-house at Morrison. Always love a happy chat with Kylie! A staggering, 132 ladies entered FOTF this year. Judges were looking for overall co-ordination, elegant style, individuality and attention to detail. The competition was tough as the standard was so high. and the winner is….Emma Reynolds! Wearing a Cue, Country Road, Mimco mix and her very own, lime Headonism fascinator. 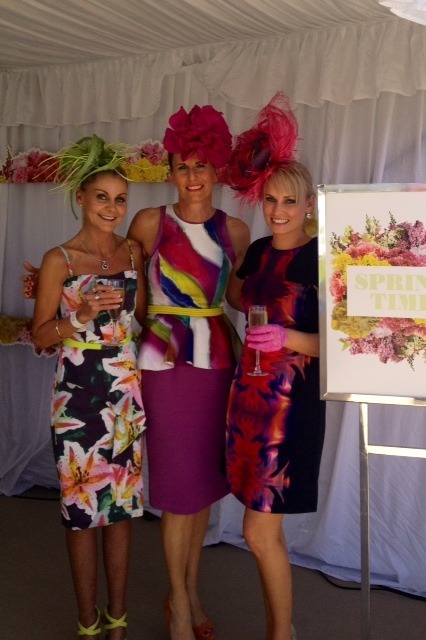 Runner-up Bridget (L) wore a Catini top and skirt, Betts shoes and clutch, Two Crowns Jewellery and Headwear. 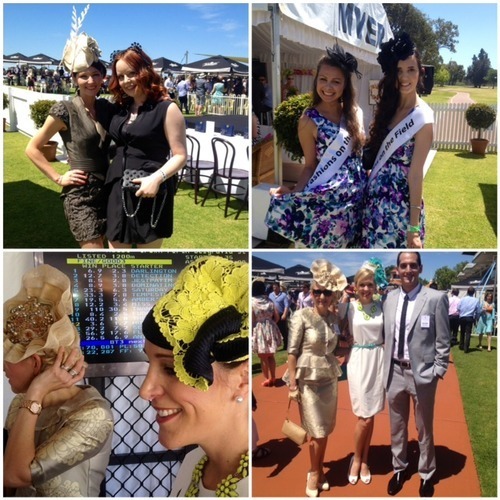 Emma is now planning her week long, all expenses paid trip of a lifetime to the Melbourne Cup. So proud of you Emma. 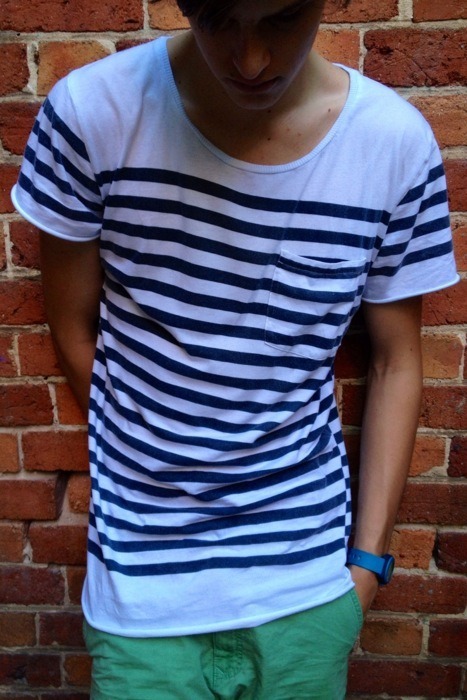 Melbourne will love your style!